Saturday October 9th 1926 It was late when we ate breakfast. It was raining then and later on there was a regular down pour till noon. I crotched some and wrote Hattie and Mrs Pickens. Just before supper took mail to the box. Went around to Art M--- Sunday October 10th 1926 I went to The M E Church. Read awhile after dinner. Took a walk to the depot to engage reservation for Wednesday PM. Came back by street car. I wrote Lydia and took the letter to mail box. Mrs Phillips called. Read in evening. Monday October 11th 1926 Had letter from Lydia and Winnie Laurence. She has moved to Chicago. Wrote her in PM. I read to Ira and finished the book I am reading. 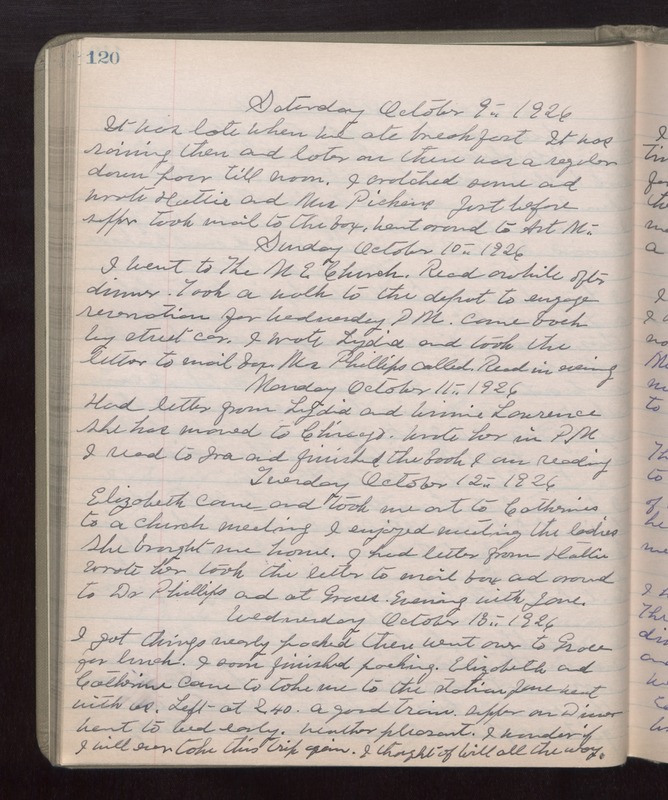 Tuesday October 12th 1926 Elizabeth came and took me out to Catherines to a church meeting. I enjoyed meeting the ladies. She brought me home. I had letter from Hattie. Wrote her took the letter to mail box and around to Dr Phillips and at Graces. Evening with Jane. Wednesday October 13th 1926 I got things nearly packed there, went over to Grace for lunch. I soon finished packing. Elizabeth and Catherine came to take me to the station. Jane went with us. Left at 2.40. A good train. Supper on Diner. Went to bed early. Weather pleasant. I wonder if I will ever take this trip again. I thought of Will all the way.